The impressive luxury camping site of Le Val d'Ussel is set on the bank of the picturesque River Dordogne in the Aquitaine region of France. This makes the ideal setting for nature lovers to enjoy and there are plenty of nature activities to enjoy such as hiking through the surrounding forest, while people who simply want to relax while indulging in luxury camping will find everything they need right at their fingertips. What makes Camping Le Val d'Ussel So Special? A luxury camping holiday is only luxurious is everyone is happy. Fortunately, there is a great number of opportunities for kids to enjoy their holiday, too. Kids aged between six and eleven years of age are provided with a wide range of activities to keep them occupied by the staff that run the kids club, while older children will find plenty to keep them busy in the dedicated play area, which boasts a brand new trampoline. 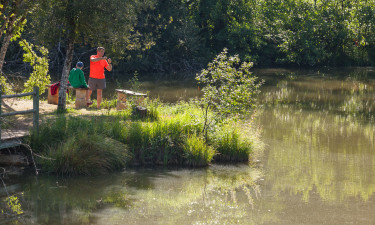 For fans of fishing, there’s the possibility to hire a rod and other equipment to spend a relaxing few hours waiting for a catch. It is also possible to take a boat out on the lake and people who enjoy kayaking will also be able to rent a craft to explore this enchanting part of France in a whole different way. The kids can have fun with their parents by playing a game or two at the colourful mini golf course that is located right on the site. The spacious LUX-camp also features a large outdoor swimming pool where the family can have fun splashing around together. When it gets too hot, savvy campers will retreat to the large outdoor swimming pool, which is set in the very heart of Le Val d'Ussel and is staffed by lifeguards and also boasts a paddling pool for toddlers to enjoy. The onsite restaurant is ready to serve up delicious meals to guests all year round and there are plenty of options here to suit people of all tastes and preferences. Those who are searching for something a bit lighter to keep them full until dinner will also be able to take their pick from pizza and other types of treats from the snack bar. 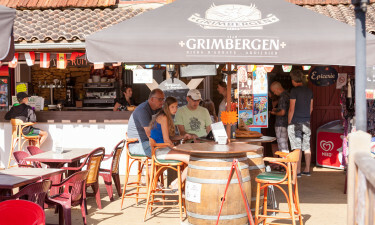 Le Val d'Ussel also features a stylish bar for guests to unwind in and enjoy locally produced wine and other drinks.